American democracy, said H.L. Mencken, is “the worship of jackals by jackasses.” This definition is as harsh as it is colorful, but Mencken was a kind of philosopher, and his judgment is consistent with philosophy’s tradition of profound skepticism about the value of democracy. That skepticism is quite justified, recent events suggest. Consider, for instance, the immigration question. It is intractable, and the reason appears to be the human mind itself. For plainly there are many Americans, both Democrats and Republicans, who are either unable or unwilling to entertain two conflicting ideas at once: a sense of duty to needful immigrants, and the need to enforce the southern border and protect the national good generally. Immensely complicated, the first idea comes into conflict with other goods, and therefore must be negotiated. For however much pity we may feel for the peoples of Mexico, Honduras, and elsewhere, the reality is that excessive low-skill immigration is not good for our own working class or Americans in general. There are only so many jobs in landscaping, construction, and other blue-collar industries, so it’s undesirable for there to be millions of people who will work for wages that don’t meet the expectations of 21st-century Americans, because the presence of such persons entails fewer jobs and lower wages for native citizens. So, the sense of duty many feel toward needful immigrants, if acted on, must be limited. The value of this endeavor needs to be weighed against other, conflicting ends. Arriving at a compromise won’t be easy, and any reasonable compromise shall be reached only through cold, rational analysis: Taking account of the context and all the ends to be considered, we can come to the best set of trade-offs. The problem here is that cold, rational analysis is something at which most people are dreadful. Learning of “separated families,” jackasses like Maxine Waters immediately become hysterical. Far from recognizing the need for national sovereignty, and the need to weigh moral duty against other interests, such persons cant about racism, xenophobia, and the like moralistic delusions. Indeed, Waters even went so far as to urge the mob to harass Trump administration officials. Not that such encouragement was needed—Americans are reliably zealous vigilantes, as Kirstjen Nielsen and Sarah Sanders, both heckled while out to dinner, found recently. As H.L. Mencken understood, the jackasses are symbiotic with the jackals, who profit tremendously from them. For indeed, not everyone who supports open borders and doing whatever it takes to keep illegal-immigrant families together is motivated by altruistic feelings. There are corporate jackals who want cheap labor, and Democrat jackals who want more voters, especially when it comes to turning red states into blue ones. Above all, ignorant support of cynical and unaccountable politicians allows them to live cushy lifestyles, which are insulated from the destructive consequences of their bad policies. Of course, American jackasses are also helpful to jackals outside the U.S. For its next president, Mexico may soon elect Andrés Manuel López Obrador. An unscrupulous demagogue, Obrador has told Mexicans that they have “a human right” to “leave their towns and find a life in the United States,” a right Obrador says Mexico “will defend.” What is the purpose of such loony rhetoric? Money, of course. Mexican illegal immigrants in the U.S. send roughly $30 billion in remittances back to Mexico each year, the country’s largest source of Mexican foreign exchange. This when Mexico already runs a $70 billion trade surplus with the U.S. Out of all our trade partners, only China’s trade surplus is larger. Shortly after issuing his executive order on June 20, President Trump ordered U.S. Customs and Border Protection to stop referring illegal-immigrant families to the Department of Justice. So for now, anyway, we are back to the catch-and-release policy of the Obama and Bush administrations. What’s the lesson here? That by letting policy be determined by blind pity, we reward people for invading our country. We are not going to prosecute these families, because children being separated from their parents is a hurtful experience. Now, common sense tells us that belligerent violating of a nation’s border should have hurtful consequences. Crime deserves punishment. Nor is this changed by the fact that some of the immigrants are in flight from horrible conditions. That is true in just the same way that being in an abusive relationship does not give you the right to break into your neighbor’s home and take up residence in it. Such punishment could serve as a deterrent, but for that to happen far more people would have to see the issue for what it is. And that is evidently asking too much of democratic man, who rejects thorny reality and demands sentimental delusion in its place. Despite several opportunities to do so, President Trump has never disavowed any of his prior statements about Islam. Taking all the relevant evidence together, a reasonable observer would conclude that the Proclamation was driven primarily by anti-Muslim animus, rather than by the Government’s asserted national-security justifications. Given President Trump’s failure to correct the reasonable perception of his apparent hostility toward the Islamic faith, it is unsurprising that the President’s lawyers have, at every step in the lower courts, failed in their attempts to launder the Proclamation of its discriminatory taint. 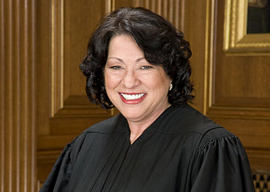 Rather bizarrely, Sotomayor takes pains to list numerous statements and tweets by the president, on the belief that these demonstrate “apparent hostility toward the Islamic faith.” Well, then, let’s grant for argument’s sake that she’s right. Logically, such hostility, however wrong in a moral sense, is not incompatible with “national-security justifications.” You can feel a deep animus for Muslims, but this in itself does not show that your policy exists for that purpose, or for that purpose only. Nor does it follow that your policy is not sound, that is, not warranted by the circumstances. The only way to know whether it’s sound is to examine the policy as it relates to them.